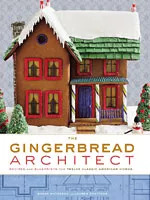 Whether you have little ones in the house or are just a kid at heart, you’ll be inspired by The Gingerbread Architect (Clarkson Potter, October 2008; $22.50). Created by an architect (Susan Matheson) and professional baker (Lauren Chattman), these gingery dwellings are exquisite and delicious. Beginners should try the basic Cape Cod house or Adirondack camp.